Personal budgets, now enshrined in the Care Act, are a key mechanism for allowing people to have control and choice over their care and support. Whilst there is evidence that helps us to understand the experience and outcomes of people receiving personal budgets, TLAP have identified that more needs to be done to make sure that councils and other organisations routinely capture and act upon the views of people with lived experience and their carers. TLAP have addressed this ‘evidence challenge’ by working with colleagues from across the care and support sector, including people with lived experience, and experts in research and evaluation. 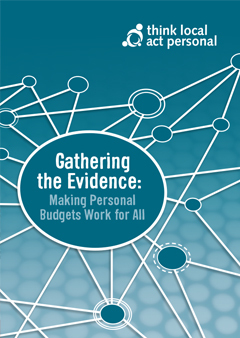 They held a series of roundtables and produced a new report, Gathering the Evidence: Making Personal Budgets Work. More use could and should be made of existing tools such as the Personal Outcomes Evaluation Tool (POET) in order to understand the experience and outcomes of people receiving personal budgets. New measures and approaches to research and evaluation should be informed by people with lived experience and carers and what matters most to them. Improving the evidence base should reflect the goal of achieving truly integrated care and support, built around individuals and their networks of support. Above all, the report makes clear that personal budgets can only be understood within the context of personalisation.